We’d love your help. 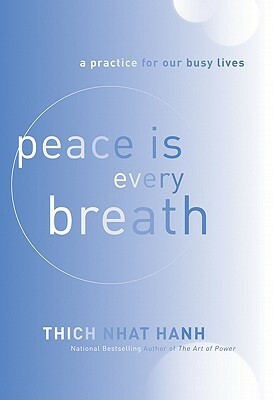 Let us know what’s wrong with this preview of Peace Is Every Breath by Thich Nhat Hanh. To ask other readers questions about Peace Is Every Breath, please sign up. I feel that Peace is Every Step was a more worldview-shattering book than this. However, this does have some ideas and concepts that are helpful, which I will run through in no particular format. This is a personal review so I can look back on it later. "I am home; I have arrived" in each moment of being in your body - no need to rush about anxiously looking toward a particular time, ever moving into the future, of when you can relax. Consciously smiling in the morning when you wake up to set the I feel that Peace is Every Step was a more worldview-shattering book than this. However, this does have some ideas and concepts that are helpful, which I will run through in no particular format. This is a personal review so I can look back on it later. "I am home; I have arrived" in each moment of being in your body - no need to rush about anxiously looking toward a particular time, ever moving into the future, of when you can relax. Consciously smiling in the morning when you wake up to set the tone. Knowing that whatever you doing at that moment - making coffee, brushing your hair, walking in the parking lot - is the only thing in the world you have to DO at that moment, so DO it lightheartedly. Don't eat WHILE reading or watching anything. Just eat and enjoy the tastes and textures. Coming back to the awareness of breathing throughout the day, which also helps me adjust my posture. "Dear habit energy, I see you!" is a very good one. It is a way to acknowledge when your mind races into the past or future, without judging, just seeing, to gently come back to the present moment if you can, or if not, to lessen the power of that energy over you. Especially when dealing with horrors of the past, you can remember that those mental movies playing in your head *are not real,* they are not happening now, and how you behave and feel in *this* moment can be completely separated from what happened then. You can also name your "mental formations" - this is anger, this is anxiety, this is irritation. By naming them you can give them a chance to calm. You cannot calm the tiger you do not see in the fronds. There is an idea of "refreshing" ourselves as flowers in bloom, rather than clenched, wilting blossoms. You've probably met someone who seems to be open and glad - glad to be alive, glad to be wherever they are, at home with themselves and not worried. This is the sort of example of how we can strive to be. Be glad to be alive. Have a solid foundation in the root of your body and bloom in your breath each minute. Undo the tensions in your body. One way is to imagine a lovely vista with calm water. Another important concept is that emotional storms will inevitably pass through you, but you will survive and get to the other side. The knowledge that it will pass makes the storm bearable and lets you wait before acting. It is okay to feel storms, and getting alone and breathing through them can be very beneficial. If your mental boat is consistently too full of baggage of worries and fears, it will ride low in the water and be easily capsized or sunken by a storm. Bail out the things you carry with you unnecessarily from moment to moment, and sail easily with enough space around you to maneuver and have love and kindness in your space instead, for yourself and others. The "store consciousness," often called the subconscious, is where your past experiences are kept in the mind, and these old stories are often triggered by present day interactions. It can get so most of your time is spent recalling old things that are not in the present. It is better to practice making *positive* reactions to reroute your mind. I personally think it may be helpful to spend some time looking in a mirror with a list of positive emotion words and practicing experiencing them and making appropriate joyful faces. Get out of the habit rut with conscious correction practice. This is right mindfulness over negative mindfulness/attention. Mindful consumption means choosing to consume things that bring wholesome peace to our body and mind. There are 4 kinds - edible, sense impressions (media we choose to consume), volition (remembering what our higher aspirations are), and consciousness (collective from our personal culture; choosing to surround ourselves with those who are wholesome and kind to avoid becoming used to those who are negative). Aimlessness means not seeking. We are home, we have arrived. We are what we want to become. We do not have to feel that we can only be our true selves later after we have accomplished something. Happiness is here. The wave doesn't need to seek oneness with the water. Deep listening means letting another speak of their troubles without interruption, judgment, or too much advice. Give advice later, in small doses, as they can digest it. Just the act of listening relieves suffering. In the moment, there is much turmoil and it is best to be patient before responding. Deep listening to yourself means taking care of your anger. Feel compassion towards your anger and toward the suffering it brings you. Wrap your anger in soothing waters and let it be quenched slowly. The book also includes short gathas, or small poems to recite during daily activities, which are interesting to consider. Gratitude in the moment is a major theme. The audiobook is full of useful info, easy to listen to and easy to understand. The narrator speaks clearly and at a slow enough rate to allow for note taking without losing fluency. There aren’t a lot of examples and anecdotes but it’s still a fairly interesting read. I definitely would recommend having the physical book or taking notes to anyone who actually wants to put the information to use. Mơi đâu đoc tưa sach "Thiên tâp cho ngươi bân rôn" hơi phan cam ti vi không thich la ngươi mang danh bân rôn đôi vơi viêc đoc sach, minh thich thanh thơi va đoc tư tư. Nhưng ma la cua Thich Nhât Hanh - Tac gia, Thiên sư yêu thich cua minh nên không khoi to mo lât ra đoc thư. Ngay trang bia la bai thi kê tương tư bai minh đoc hoai môi sang: "Thưc dây miêng mim cươi. Hăm bôn giơ tinh khôi. Xin nguyên sông tron ven. Măt thương nhin cuôc đơi." Bai minh đoc thi câu cuôi la "Hiên dâng cho cuôc đơi". D Mới đầu đọc tựa sách "Thiền tập cho người bận rộn" hơi phản cảm tí vì không thích là người mang danh bận rộn đối với việc đọc sách, mình thích thảnh thơi và đọc từ từ. Nhưng mà là của Thích Nhất Hạnh - Tác giả, Thiền sư yêu thích của mình nên không khỏi tò mò lật ra đọc thử. Ngay trang bìa là bài thi kệ tường tự bài mình đọc hoài mỗi sáng: "Thức dậy miệng mỉm cười. Hăm bốn giờ tinh khôi. Xin nguyện sống trọn vẹn. Mắt thương nhìn cuộc đời." Bài mình đọc thì câu cuối là "Hiến dâng cho cuộc đời". Dù là câu nào cũng hay quá đỗi. Rồi đọc thêm mấy trang nữa quyết định là mình phải mua. Quyển sách nhỏ với kích thước 10x15 có thể bỏ túi dễ dàng, đi đâu, chờ ai lâu lôi ra đọc không bị ai để ý ^__^. Tuy là cuốn sách nhỏ nhưng nội dung lại chứa đựng tinh hoa của rất nhiều cuốn sách: Đường xưa mây trắng, Giận, Hạnh phúc Mộng và thực, Bông hồng cài áo... và nhiều quyển khác mình chưa đọc. Từng giây phút, từng việc mình làm (dù là lái xe, rửa chén, ăn cơm...) đều có thể quay về với hơi thở, đưa thân và tâm về một mối, để có thể sống trọn vẹn trong từng phút giây của hiện tại. Và mình đã thử và duy trì thực tập, dù không phải lúc nào cũng thực tập tốt, nhưng những lúc làm được đúng là mình sống sâu sắc, biết ơn và hạnh phúc hơn rất nhiều. This one really suffered from not being read by Hanh. I have listened to a couple of his other works, one a book and one a lecture, where he is the narrator/speaker and his speaking style is just out of this world awesome. A lot of it still comes through in his writing, but you miss so much of the great care with which he treats his world and the wonderful pacing that he uses. Still, lots of wonderful teachings and firm, real world examples that I would love to have form the very core of who I am This one really suffered from not being read by Hanh. I have listened to a couple of his other works, one a book and one a lecture, where he is the narrator/speaker and his speaking style is just out of this world awesome. A lot of it still comes through in his writing, but you miss so much of the great care with which he treats his world and the wonderful pacing that he uses. Another excellent book by Hanh focusing on the importance of peace and centering ones self in that which is important. This book helps as a guide for self-reflection, very impressed with all of his work. 2.5 rounded to 3 because the poems at the end were well written and useful. The rest of the book is very preachy, telling us what we should do. When it's not shoulds, it's pretty basic info. The book begins with concrete suggestions for cultivating mindfulness and concentration while doing everyday activities, such as waking up, washing your face, and brushing your teeth. The topics then become broader and more abstract, touching on subjects such as breaking out of the prison of the past, contemplating impermanence, and the nature of true love. Cuốn sách là những bài học nhỏ, hướng dẫn chúng ta thực hành thiền tập trong đời sống hàng ngày. Ngay từ những công việc nhỏ nhất như thức dậy, đánh răng rửa mặt buổi sáng, Thầy Thích Nhất Hạnh hướng chúng ta đến cách sống thức tỉnh trong từng giây phút ở hiện tại. Giống như là khiến mỗi chúng ta ý thức được rằng mình đang sống. Mỗi bài kệ đều rất ngắn gọn và súc tích, nhưng thật lòng mà nói đối với hầu hết những cá nhân sống trong thời đại này, những người đã và đang thích nghi với cuộc sống nhộ Cuốn sách là những bài học nhỏ, hướng dẫn chúng ta thực hành thiền tập trong đời sống hàng ngày. Ngay từ những công việc nhỏ nhất như thức dậy, đánh răng rửa mặt buổi sáng, Thầy Thích Nhất Hạnh hướng chúng ta đến cách sống thức tỉnh trong từng giây phút ở hiện tại. Giống như là khiến mỗi chúng ta ý thức được rằng mình đang sống. Mỗi bài kệ đều rất ngắn gọn và súc tích, nhưng thật lòng mà nói đối với hầu hết những cá nhân sống trong thời đại này, những người đã và đang thích nghi với cuộc sống nhộn nhịp, hối hả, không lãng phí một giây, một phút nào để lo lắng cho tương lai, sự nghiệp, tiền bạc, tình cảm... thì những bài kệ sẽ trở nên khô khan, khó hiểu và khó thực tập nhiều lắm. Riêng mình cũng không làm được tất cả những gì trong cuốn sách nêu ra. Nhưng qua kinh nghiệm bản thân thì mình rất muốn chia sẽ với các bạn là việc thiền (Meditate) mỗi sáng và mỗi tối rất tốt cho sức khỏe và tình thần. I'm not rating this as I feel it is one of those books that can mean more to you in a couple of years time, when you pick out a special chapter and re-read. Con: I'm not rating this as I feel it is one of those books that can mean more to you in a couple of years time, when you pick out a special chapter and re-read. Peace Is Every Breath is a quick read, and a great introduction to the idea of mindfulness seen through the buddhist philosophy. Nhat Hanh makes an effort in this book to educate readers on his groundbreaking ideas of buddhism that is applicable to the present day, and presents not only the mantras themselves, but also guidelines on how to approach and understand them. If you are short on time and looking for a simple read that you can use as a sort of guidebook and continually come back to - th Peace Is Every Breath is a quick read, and a great introduction to the idea of mindfulness seen through the buddhist philosophy. Nhat Hanh makes an effort in this book to educate readers on his groundbreaking ideas of buddhism that is applicable to the present day, and presents not only the mantras themselves, but also guidelines on how to approach and understand them. Outstanding book on mindfulness!! Designed for modern day, busy workers like myself. Thich Nhat Hanh poignantly discusses ways to always return you mind to the moment, whether you're washing dishes, getting in the car to go to work, or taking a few minutes for a quiet walk. You don't have to sit to enjoy the benefits of meditation. You can mediate throughout the day, staying mindful and being present. I highly recommend this book! It is interesting to me how much similarity there is in evidence-based, non-mystical works on mindfulness and works more based on a mystical tradition in terms of describing practice and technique. That said, I strongly prefer the former, and this was mostly either familiar to me or new poetry of the sort I'm not really seeking. I want to live more mindfully and I try to have an open mind about it. I like the concept, but I can't get into Thich Nhat Hanh. I find myself thinking the emperor has no clothes...he's just a brand. i mean, of course. thich nhat hanh is the best. i read it faster than one should read a book about mindfulness, but i just got so excited to practice that i couldn't help myself. Nice ideas, but I felt that it read like a self-help article in a magazine - over-simplified and casual. This book packs a ton of thought provoking wisdom in a small package. I already know that I will be reading this again and again to hopefully absorb its knowledge and guidance. I can't even figure out where to begin. Clearly not the right introduction to mindfulness for me, so full of privilege, sexism, hetero&gender normativity, ableism... I can't even fathom an author who ends a chapter urging the reader to acquire another specific title he wrote and follows the urging with a chapter on mindful shopping. Anger should not be felt because in 300 years we and the person towards whom we feel anger will be dust? Working towards not having anger consume us is great, bu I can't even figure out where to begin. Clearly not the right introduction to mindfulness for me, so full of privilege, sexism, hetero&gender normativity, ableism... I can't even fathom an author who ends a chapter urging the reader to acquire another specific title he wrote and follows the urging with a chapter on mindful shopping. Anger should not be felt because in 300 years we and the person towards whom we feel anger will be dust? Working towards not having anger consume us is great, but he goes on to say, that person is a treasure. Really?!? The cop who kills a black teen for no reason is a treasure to the grieving mother, to other black teens angry that they get racially profiled too?!? There is no "Buddhist gift" follow up; no silver lining support suggesting how a person who invokes anger is "a treasure." That's just one of many examples that I find egregiously privileged. I can't outline all. This would be a line for line analysis plus a commentary on the overall social assumptions of I were to take it on fully. Each chapter can be read in 5 or 7 minutes first thing in the morning, during lunch time, or some time before bed - which is what I do and find effective, perfect for very busy people. Some may argue the 2 to 4-page sections can be read in 1-2 minutes, but if you rush the reading, you may miss the point of being mindful. Slow down whatever that are happening in your mind, read the book slow, enjoy every bit of the teachings, and allow the material to naturally touch what lays deep inside of you. Each chapter can be read in 5 or 7 minutes first thing in the morning, during lunch time, or some time before bed - which is what I do and find effective, perfect for very busy people. Some may argue the 2 to 4-page sections can be read in 1-2 minutes, but if you rush the reading, you may miss the point of being mindful. Slow down whatever that are happening in your mind, read the book slow, enjoy every bit of the teachings, and allow the material to naturally touch what lays deep inside of you. Also, read the book by chapters, one chapter per day (or every other day), and return to the chapters that you don't understand/don't fully understand yet again and again. This is my advice for reading the book in order to grasp the many levels of deep meanings it is trying to convey. I also like the gathas section near the end of the book. Despite the fact that some may be hard to grasp in the first read, they are generally short and easy to remember. Every time I remind myself of them while washing hands, drinking water, or whatever business I engage in, I can always find a different layer of meaning in such succinctly, beautifully written verses. I really appreciate having a chance to read this book, and hope you will find the book helpful, too. Thank you, Thay, for such a beautiful work. I love me a good Thich Nhat Hanh book. They're usually quick and simple to digest, chock-full of easily-applied sage wisdom from one of the most influential Buddhist leaders in the West. “Peace is Every Breath” is no exception. Hanh is a world-renowned Vietnamese Zen Buddhist master, poet, scholar, and peace activist who attempts to show people how to incorporate the practice of mindfulness into each and every waking moment. 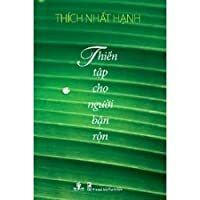 The followup to his bestselling classic, “Peace is Every Step”, the chap I love me a good Thich Nhat Hanh book. They're usually quick and simple to digest, chock-full of easily-applied sage wisdom from one of the most influential Buddhist leaders in the West. “Peace is Every Breath” is no exception. Hanh is a world-renowned Vietnamese Zen Buddhist master, poet, scholar, and peace activist who attempts to show people how to incorporate the practice of mindfulness into each and every waking moment. The followup to his bestselling classic, “Peace is Every Step”, the chapters of this book flow together as a helpful guide that the reader can use to live a fuller life. The wisdom held in this book is so simple that if you read without a stop to reflect and practice, it'll rush on like a running river, only a few drops of the wisdom will be left behind. Thus, I resolved to read only one passage a day. It can be summed up into: mindfulness, breathing, wonder, joy, calm, in every single activity starting from our first sight in the morning and last sight at night. As this was the first of Hanh's books I'd read perhaps I'm just unaccustomed to his style, but this didn't really strike me as particularly enlightening (hey look, a pun!). The basic premise of finding mindfulness in the procedures of everyday life is sound, but some of the recommendations don't seem especially practical or relatable; almost as if he doesn't realize 99% of his audience are not Zen monks sequestered in (I'm assuming) a peaceful and rather conflict-free monastery. Tập sách rất hữu ích, cho người đọc hiểu được thiền không phải chỉ có cách duy nhất là ngồi kiết già như nhiều người lầm tưởng, mà còn có thể thực hiện trong mọi hoạt động đời sống sinh hoạt hằng ngày. "Chánh niệm là năng lượng thắp sáng ý thức chiếu rọi vào những gì đang xảy ra bây giờ và ở đây. Chánh niệm là trái tim của thiền tập." Có lẽ câu này tóm gọn nội dung của quyển sách. Làm gì thì làm, thực hành chánh niệm là ta đã có thể thiền tập rồi, không câu nệ tiểu tiết và hình thức. I love everything by Thich Nhat Hanh. This one was mostly about mindfulness in very specific situations throughout the day. It's quite nice to just use as a short meditation before you engage with the day, go to bed, brush your teeth, eat dinner, etc. A great one to keep on the bedside table or coffee table for easy access at all times! This was a cute little read. Thought provoking and it offered wonderful little "gathas" to ponder during mindful meditation. The introduction says this is a continuation of two other books, The Miracle of Mindfulness and Peace Is Every Step. I enjoyed this book and the authors writing that I think I'll be checking those two out as well.